First of all, I want to thank everyone who participated on the kick off of this Nostalgia. 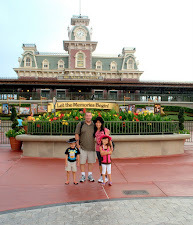 Keep traveling with me down memory lane and keep it going. My second entry are the churches that we are/were members to. First up is the St. Paul, this is where we attended since I arrived in the States until 2008. Our last attendance to this church was two weeks before we left to Korea. This is the view at the back. Adjacent to it is is the St. Paul School which we originally planned to send our kids to but since we bought this home near at St. Josh, our plan was changed. Aside from membership, this is also where our two children got baptized. We were friends with Fr. Tony, he is a very sincere and friendly priest. I remember when I first came to their church, he asked me if he can bless my baby inside my tummy which made a big impact in me. 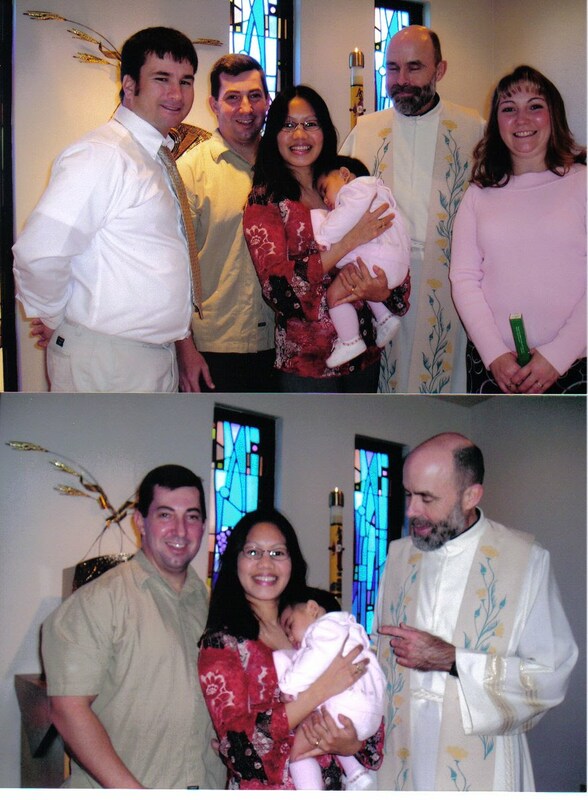 He was the one who baptized Rylie (Dec. 2005) and EJ (Dec. 2007). When Rylie was baptized, my FIL wasn't able to come so we thought that he won't attend to EJ's baptism either but we were surprised because he did. Our new church is St. Joseph the Worker. We decided to change our membership from St. Paul's to this one because it is within our neighborhood. We can just walk from our house to the church whenever we want to. Me and Rylie walked last Sunday when we attended church without the boys. One more reason we transfered is the fact that Rylie will start school this year and for us to avail the discount at St. Joseph school, you have to be a member of the church too. I can just walk my daughter from our home to the school. I really love where we live right now because we are so near with a lot of establishments like bank, post office, church, school (elementary, high school, college) and stores. I copied the last photo at St. Joseph's website. Hi Rose, sali ako ngayon, meron akong lumang photo. Thanks for sharing your beautiful journey with us. Wow, buti ka pa may pictures ng church na pinag binyagan ng ma anak mo. Sa Pilipinas lahat bininyagan mga kids ko, pero di kami nakapag picture sa church, bakit nga kaya? isang malaking katanungan. Naku kainam naman na pwede na palang lakarin ang school ni Rylie, that's a great advantage, then eventually si EJ na ang mag aaral..time flies Rose, before you know it, High School na sila, wahhh! thanks for sharing....:) bukas na sakin...isip isip muna ako...nyahahahha! Oh my--how time flies by--baptism ang entry mo sa nostalgia.then this school year start na cya ng school,same church sa baptism nya. sa susunod ikakasal cya!!waaahhh!! My hands are full these days(T_T)pasencya nakung di makasupport ng visits sa sites mo. Oh look at me there, a little bit skinny lol.. I joined Mrs. C.
Haist thanks for dropping by sa page ko Ateh,.. I love you place bakla accesible to everything and you have the church to go to with your family. At home na at home and lugar ninyo. Buti ka pa bading napa binyagan na mga anak ninyo, kami wala pa. Thanks for sharing bakla. Mukhang mas malaki nga yung simbahan nang St Joseph kaysa dun sa St Paul. Mabuti naman at duon sa St Joseph papasok si Rylie sa pasukan. Ang ganda naman nang mga kuha ninyong litrato duon sa binyag ni Rylie at ni EJ. Pasensiya ka na na hindi ako makasali sa Nostagia meme mo. Wala lang talaga akong pictures, old or new na natira matapos kaming bahain more than two years ago. Thanks for the post. God bless you all always. Hello there,Ate Rose!Inabutan ako ng panahon ni kupong-kupong para bumalik, sobrang ikli naman ng post ko lol! Ay Rose, sorry talaga dear, di pala ako nakacomment ... hahahah,,, shame on me. 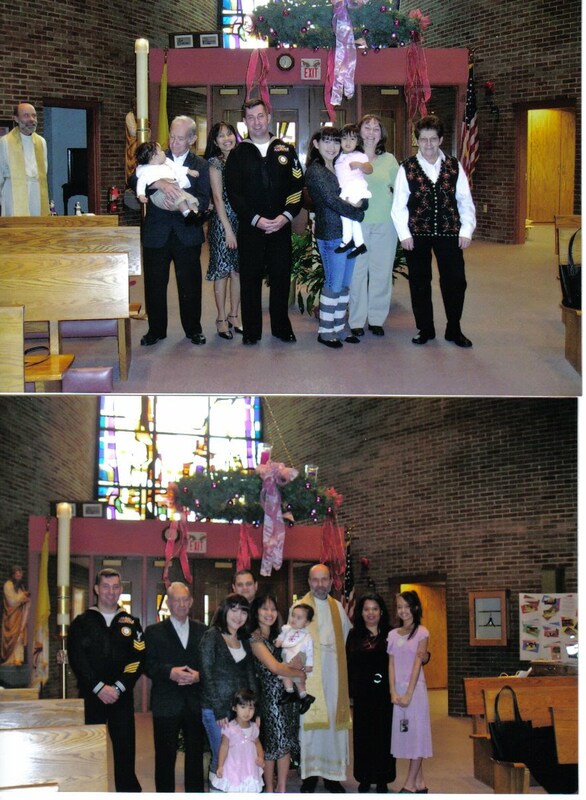 Glad to know the kids are baptized on Christian rites. Ingit ako sa church ninyo walang banderitas at walang nagbebenta ng popcorn sa labas at ang linis ha .... LOL! very lovely churches. How long were you in Korea. Thanks for inviting me to join this meme. I am sorry I won't join as I have joined so many, and I have to be sure I post to the ones I have committed. late na ko nakapagpost. ang ganda naman ng place mo malapit lang sa church.